The #18 Michigan Wolverines take on the #13 Northwestern Wildcats this Saturday at the Big House at 3:30. What is expected to be a tough defensive battle is going to a true test for both of these Top 25 teams. As usual, here is my breakdown and prediction. The Wolverine offense has come on of late. In what was a worse performance than the scoreboard showed in Utah, to not-so-impressive performances against two cupcake opponents in Oregon State and Maryland the offense has turned a corner beginning with BYU. While the Maryland performance wasn’t one for the ages consider the weather conditions (very very windy) and missing their starting running back DeVeon Smith. On the bright side, Smith is expected to play this week, and was actually expected to play last week as well but it was a last minute decision to keep him in Ann Arbor because he wasn’t really needed. Points won’t come easy, and likely won’t come often for the Wolverines this week. Northwestern ranks fifth in the NCAA in total defense, only allowing 247 yards per game, however the Wildcats rank 26th in rush defense, allowing 117 yard per game, Michigan’s strong suit. If the Wolverines can crank out a lot of success running the football, they will control this game and wear down the Wildcat defense. It will be tough, and it will require a lot of hard work and grit in the trenches, but it is possible. The key to success is the run blocking. The run blocking for Michigan has been so-so. The pass blocking has looked good, while the run blocking has been good at times and bad at times. The front five will need to keep the Wildcats front five at bay. I would not be surprised to see the Wolverines open up the passing playbook a bit as well. Northwestern is likely going to focus on stopping Smith, Johnson, and the Wolverine rushing attack, leaving some spots open for the passing game to make some noise. While I don’t foresee Rudock throwing the deep ball on multiple occasions, or at all unless needed I do think he will use a lot of screen passes. Amara Darboh, Jehu Chesson, and Drake Johnson are very dangerous in the screen passing game and the Wolverines need to get the ball in any of these guys’ hands in open space. I would also like to see a freshman step up. Grant Perry is who I would like to see have a strong performance in a big time game. For Northwestern, it is mostly the same for the Wolverine offense. It will not be easy to score… Nobody has is two consecutive games actually. Northwester quarterback Clayton Thorson has thrown for 711 yards so far this season with four touchdowns and three interceptions. He has also ran for 165 yards and four touchdowns. 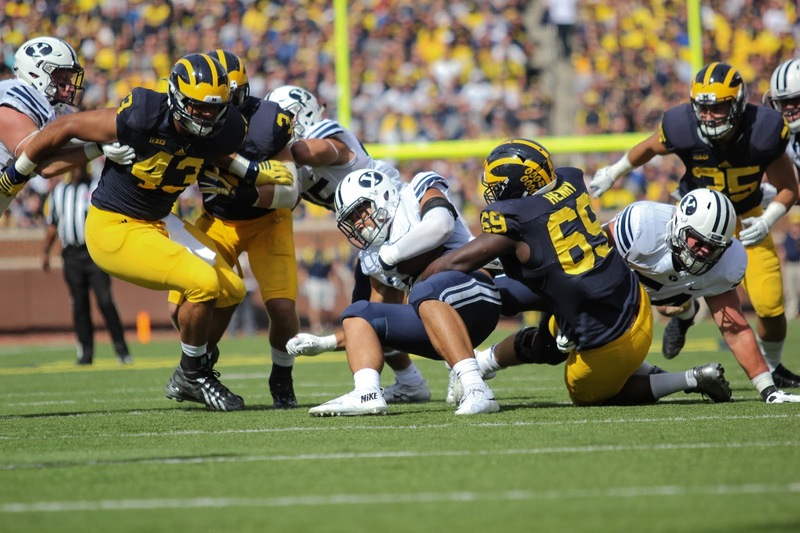 The Wolverines had no problem with Tanner Mangum of BYU, who could hurt you with both his arm and legs. The Wolverines came after Mangum from every which way, and smothered him from start to finish. Thorson is going to need some of the best protection he has had all season to keep his jersey clean Saturday. Top running back Justin Jackson has 636 yards and only one touchdown on the season. Nothing special from the Wildcat offense which like Michigan, is led by their very tough defense. I don’t expect much from the Northwestern offense. If they do score, it won’t be much. Like said above, the Wolverine defense smothered Mangum early and often, and didn’t allow the BYU offense to score, and kept them right around 100 yards of offense. The Northwestern offense is not quite as talented as the BYU offense, which is why the Wolverines will stuff them again and again on Saturday. It will not surprise me one bit if the Michigan defense is able to hold Northwester right around the 100 yard mark, which would be the third time this season. I firmly believe the Wolverines have a very good chance at shutting out the Wildcats this week. The strongest part of the Northwestern offense is the passing game. Channign Stribling should return to the lineup this weekend, and the rest of the secondary keeping wide receivers on a leash, stopping the passing game shouldn’t be a problem. If Thorson is given time to throw, there will not be anyone open. His line will not be able to give him enough time to let someone get open. The loss of Mario Ojemudia is a key loss for the Wolverines, but defensive line may be the deepest position on that side of the football for the Wolverines. Watch for an assortment of players to step up and make big plays. Northwestern also trots out a very impressive defense, led by the ability to stop the passing game. The Wolverines don’t offer an elite passing game, but the running game does the talking for them. Northwester will need to focus on hitting Smith in the backfield with multiple defenders. Smith runs with power and precision, and if the tackle is not textbook he can slip right out of it. The Wolverine offensive line is far from where it needs to be despite it being better than last year and the Wildcats will surely take advantage of that. Northwestern will likely benefit from a forced turnover in the game, an intercepted pass. The biggest key overall for this game, and in all seriousness is the special teams play. Field position will mean LITERALLY EVERYTHING. The scoring will be so few and far between due to these very strong defenses, that if a team is able to start with good field position they will likely strike, and who knows if the other team can counter with a score. Blake O’Neill has been excellent this season, and if the Australian punter keeps it up this week the Wolverines surely won’t have any problems. Yes, it is going to happen. The Wolverines will shut out its THIRD STRAIGHT opponent this week, and get a big statement win with momentum headed into the home clash with Michigan State next week.